Due to federal and state budget cuts, the Internal Revenue Service and Illinois Department of Revenue have reduced the paper forms distributed to libraries. 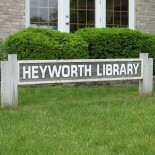 Heyworth Public Library typically receives a limited number of IRS Form 1040 and the Illinois IL-1040 tax form. Tax forms may be printed from library computers or copied at library photocopiers at the cost of 15 cents per page (black & white). Patrons may utilize the library’s public access computers to file taxes online; however, assistance is not provided with the process.